Scapino Ballet, Netherlands oldest dance company, celebrated its 70th birthday with an exceptional performance of"Ting" by the company's artistic leader and choreographer Ed Wubbe. The performance on October 3 at the Luxor Theater In Rotterdam was a combination of dance and circus accompanied live by pop band the NITS. The band's songs have beautiful melodies and provided tremendous energy and exuberance to the performance. The theater was converted into a circus with a revolving stage and a pole and rope were fixed in the middle of the ceiling. On three sides the audience sat in high positions, on the fourth side were the musicians. For the dancers, Wubbe created theatrical choreography in which his dancers smoothly blended into the subtle "dance" of an acrobat that floats through the air like a spiral and sags downwards in vertiginous spins and velocities. On the clear songs of the band with eloquent lyrics like "I am walking with the blind man I am talking to the deaf man…," it is often the work's duets and solos that interpret the tragedy and emotion of them with big gestures or in a quiet manner. A moment later, the group with top hats and a chair in the hand, dance on the round circle and create a play of illusion of walking and standing still when the dancers get on and off the rotating stage. A few people are heavily dressed, like the clown in a grotesque white suit on a bicycle or a woman with her long red glitter dress embody the darkside in the piece. Some dancers express laughter and screaming and conscious ugliness. Not my favorite part. Asian influenced sounds then triggered all of the dancers to jump, turn and run in unison. The fusion between band and dancers was optimal. This was also the case when the musicians accompanied the tension of a lonely acrobat dancing around the pole. A beautiful duet was danced on the song "Dance with me, I am falling" in which the dancers revolved around each other and held each other's heads in an embrace that felt like a fairytale moment. 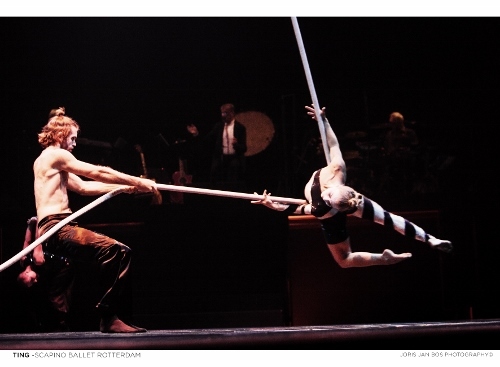 The moments that are subtly alternated by the stillness of a following acrobat, that unexpectedly flies through the air are the most unforgettable ones. "Ting's" fusion of circus, ballet and a live concert was excellent and executed beautifully by all thirty-four performers. Scapino Ballet in Ed Wubbe's 'Ting'.